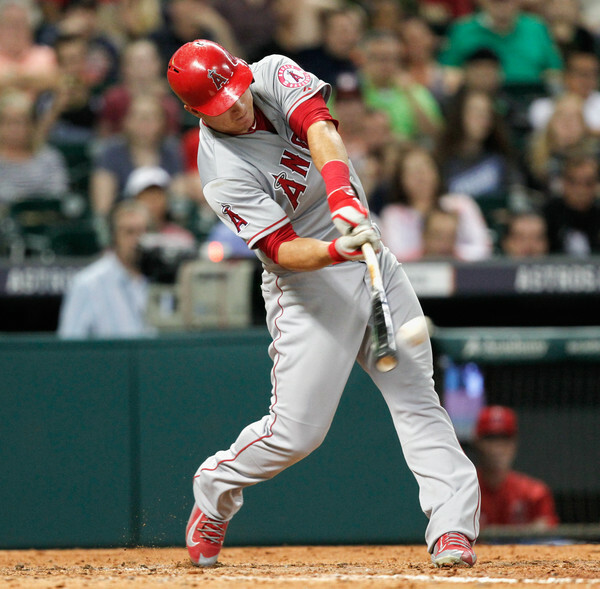 Here’s Trout hitting home run #100. Spoiler: he hit #101 a few innings later. Texting with my buddy M.J. Lloyd before tonight’s ballgame, he brought up a good point. In today’s sport world, everyone is always searching for the ‘next Trout’ or ‘next Kershaw’. It leads to diminished returns and not really appreciating what is in front of us. As M.J. (wise man in the ways of the Trout) pointed out, he’s essentially ruined being a prospect for the next 20 years. There won’t be another Trout in our lifetime. Just like there’s only been one Mickey Mantle and Ted Williams and the Darryl Strawberry’s who came along after them did not reach the lofty expectations set by the legend. Tonight, the legend of Mike Trout grows. So Mike Trout’s 100th career home run will go into the record books, a textbook Trout blast into the Crawford Boxes in Houston off Roberto Hernandez (he’ll always be Fausto Carmona to us). It of course comes in an Angels win, because that’s what big games from Mike Trout usually result in for his franchise. Mike Trout is now the youngest member of the 100 home run/100 stolen base club in baseball history. Feather in his cap of all the other insane things he’s done. I am sitting here currently debating whether or not he’s the best talent that I’ve ever seen. Some would want to bring Bonds into the conversation; for me in terms of the eye test and pound for pound clean talent; it’s between him and Junior Griffey. That’s the only thing I can relate what I’m seeing from Trout to. Finally, M.J. added: “The worst thing a prospect could be called now is the next Mike Trout”. Yes. Yes Mr. Lloyd you are correct.